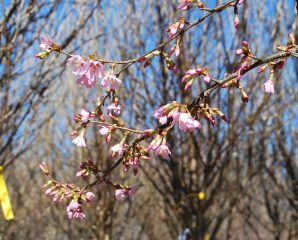 Prunus x ‘Okame’ is a flowering Cherry that blooms with small deep pink buds and opens bright pink. In the fall the leaves turn a bronze red and orange and the bark is a beautiful reddish brown that stands out in the winter months. It’s a nice choice for a street tree, along the driveway, in the front yard or back, as it grows about 25′ high x 20′ wide. It has an upright, rounded habit and requires little pruning. Like most Cherries it needs a full sun location with moist, but well-drained soil. They bloom March – April, one of the first in a long line of spring flowering trees. Under-planted with Mt. Hood or Thalia Narcissus and Grape Hyacinths would really cheer spring on!